You will first turn on your iPhone and Apple Watch. When the Apple Watch finishes starting up, tap to choose your language and region, then follow the onscreen instructions. 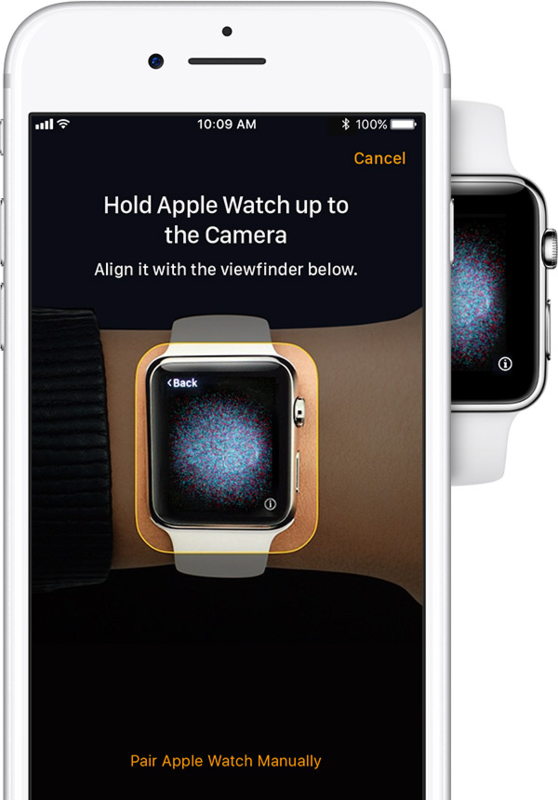 When prompted, position iPhone so that Apple Watch appears in the viewfinder in the Apple Watch app. Watch Analytics -- Select “Share with Apple” to help Apple improve its healthcare initiative. You can learn more about this option by clicking the “Learn More About Watch Analytics” link at the bottom. Otherwise tap "Don't Share"
Apple Pay -- Tap "Set Up Later in the Apple Watch App"
Your Apple Watch will now begin syncing! Wait for it to finish before proceeding. Don’t stress if you make a mistake during this process. You can always change the Watch settings after you’re finished setting up. Once your Watch has finished syncing, install Simplifeye on both devices by performing the following steps. Make sure you're connected to a good Wi-Fi network. Tap “GET” (or the cloud icon) to download the app to your phone. NOTE: Apple requires users to sign in with an Apple ID to download an application. After the iPhone app download is complete, open the Watch app and scroll down to find Simplifeye on the My Watch tab. Tap "Install" and wait for the download to complete. 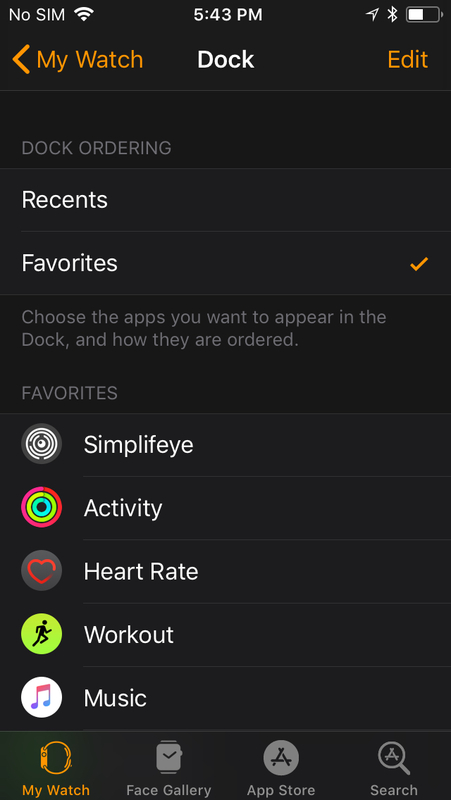 For the best Simplifeye experience, we recommend you change the following additional settings in the Watch application on the iPhone. Raise the Alert Volume to its highest setting. Raise Haptic Strength to its highest setting. Adding the Simplifeye button to your doc will allow you to immediately access Simplifeye with a press of the side button; no need to sift through small icons! Open the Watch app on your iPhone and select the My Watch tab. Go to Dock and tap Favorites at the top of the page. Scroll down and find Simplifeye in the "Do Not Include" section. Tap and hold the three horizontal lines on the right and drag it up to the top of the section marked "Favorites". Tap Done in the top-right corner to save your changes.